The Oppo R9s is due to get another color option to complement the existing black and two shades of gold. Revealed by a post on Weibo, the new version is in a brilliant red color and will be available in China before the end of the year, the source claims. The report doesn't say anything about hardware changes (not that a new color mandates any), but the R9s is already a pretty nice package as it is. A FullHD 5.5-inch AMOLED display, 14nm 4K-capable Snapdragon 625 chipset, and 16MP cameras front and back will almost make you forget that Oppo hasn't had a true flagship since the Find 7 more than two and a half years ago. 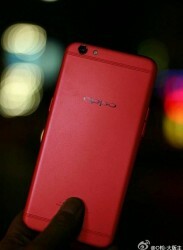 The Oppo R9s is priced at CNY 2,799 in its homeland (about $400), and there's no reason why the red version should be any different. It's also unclear whether the new color will be available globally.